Good morning everyone. I think I'm finally back and feeling much better. While sick I did managed to get a lot of stuff designed. Now I just need to get it all pulled together and take pics. Hope you all had a wonderful holiday Sam and I just stayed around the house and did some clearing out of a lot of stuff. We are starting to go through everything and get rid of as much as possible for our up and coming move to FL. Today I have to share a treat box I made a while back and never got around to getting pics and getting it posted. Last night I had a customer ask if I had the Minnie box to match the Mickey box so I took some pics and got it listed. YEA she bought some of both. I am so happy to hear that you are feeling better! I appreciate all of the sweet comments you continue to leave! This is such a super cute project, I just love that adorable treat box. 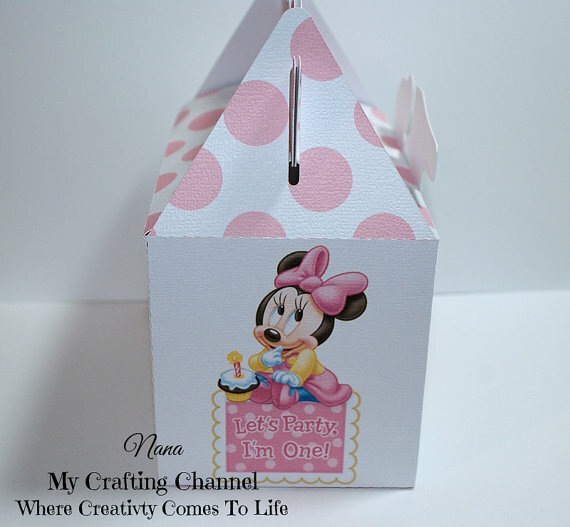 The Minnie Mouse theme is so sweet and I love the digital papers you used! Happy you are feeling better, I know you have had a rough time. Well this is so adorably cute!!!!! I love the big pink polka dots and Minnie is just as cute as she can be! Love this darling box! Happy to hear that you are feeling better my friend! !I was missing some of this cuteness!! WOW..moving to Florida! Awesome news!! Happy for you & Sam!! The Minnie mouse treat box is absolutely adorable!! Adorable-I LOVE your treat boxes!! So darn adorable!!! I love the Minnie~she is so sweet!!! Perfect for that 1st birthday! So glad you found some time to craft...missing your creations! I'm Happy to hear that you are feeling better!!! You make the cutest treat gable boxes. love the minnie mouse! Glad to hear your feeling better! YAY! Doing the clean out stuff is a drag though... I know you got to before your move.. it can be hard to toss things... I've been doing that for the last 3 years... since we moved... But somethings I just can't seem to part with.. :) Your treat box is adorable! Have a great weekend! Adorable!! I have a two year old granddaughter who would love that!! Its great to see a post from you Nana. I am so glad you are feeling better-especially since you have a big move coming up. 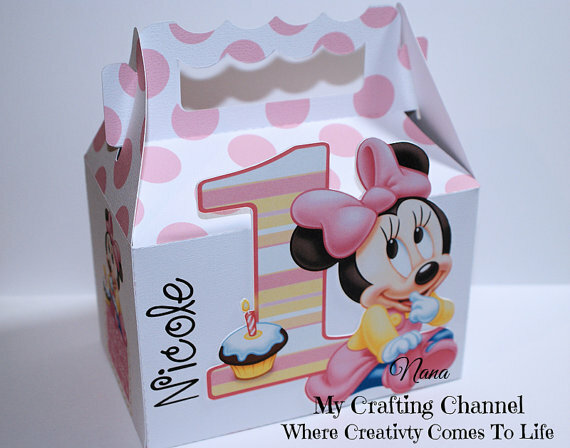 The Minnie Mouse treat box is is perfect for a first birthday party. Oooh la la...soooo cute. Cuteness overload indeed! !